What's For School Lunch? 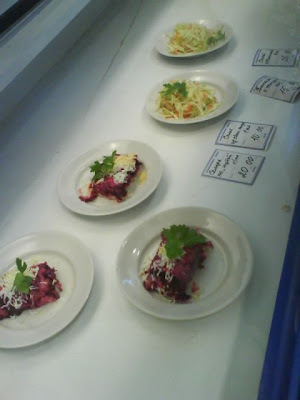 : Russia School Lunch - "Sardine Under Fur Coat"
Russia School Lunch - "Sardine Under Fur Coat"
Contents: "Sardine under fur coat," made from: sardines, boiled potatoes, boiled beet, fresh onion, some cheese, and parsley. In the far side of the picture you can see a vegetable salad, ingredients are: cabbage, carrot, parsley and salt). Notes: Notice the prices by the food. Students pay for the food at this art school. It's salted herring, not sardines. and I assure you that it tastes as good as it sounds. hahahah. I don't like this salad cause of beetroots, but my family is crazy about it! And there're more ingredients in the recipe. My Mom's recipe inludes salted herring, boiled potato, boiled beetroot, fresh chopped onion, boiled egg, fresh apple and mayo. And it's not suppose to be mixed, layers only! Herring under fur coat ("sardine" is an incorrect translation) is great. I eat it for almost every holiday celebration. But in a school kitchen, I highly doubt it'll come out right. It already looks botched in the picture; the cooks mixed the ingredients instead of layering them. And once you hit a certain age, having fish on your breath at school will damage your social standing.